The death penalty will be implemented within another two-three months despite objections, President Maithripala Sirisena told Parliament yesterday. The President, speaking during the debate on the Order under the Transfer of Offenders Act, stressed that he was determined to go ahead with the death penalty against those convicted for drug related offenses. The President underlined that the Welikada prison is the hub of all drug related crimes in the country, adding that plans are underway to control such activities. “Plans have been made to transfer prisoners convicted of serious crimes to Boossa,” he added. “The death penalty is operative in countries such as India, the US and Singapore. Some of them have the electric chair while some use injections for that purpose. We need stringent laws to make a law abiding and spiritual society. I have been requesting a list of those sentenced to the death penalty for over one and half years now, but it was delayed. This was even prior to Thalatha Atukorala assumed the Justice Ministerial portfolio. I received the relevant reports only in January and there are problems in some of them. After the announcement of my intention to implement the death penalty, the death row prisoners who had not previously appealed against their verdict have filed appeals. “There is a Pakistani national whom we can easily execute, but I do not want to hang a foreign national. I requested Pakistan to take him back, but this Pakistani national is reluctant to go. He knows that the law will be implemented against him expeditiously in his own country unlike in Sri Lanka,” the President noted. “I request Human Rights Organizations not to object to the move to implement the death penalty as it is done to control the drug menace and underworld activities in Sri Lanka. The country is now proliferated with various drugs including marijuana, cocaine, heroin and Ice. Come what may I would put into practice the decision I took to implement the death penalty within next two-three months” he stressed. At the outset of President’s speech, he also regretted that he could not attend Parliament sessions for more than three months. “I came to know that my absence for over three months was discussed in the House. I admit it as a mistake on my part,” he said. With reference to Tuesday’s debate on the PRECIFAC report and the accusations against him over the delay in taking action, the President said it was the Justice Ministry and the Attorney General’s Department which should be responsible for the delay. “Now, many have forgotten the fact that the PRECIFAC report and the Bond Commission report were tabled in Parliament on the same day. It is the duty of the Justice Minister to follow them up. I do not say that Minister Thalatha Atukorala made those delays, but I think there had been a delay on the part of the past Justice Ministers,” the President said. The Human Rights Commission of Sri Lanka (HRCSL) questioning the deployment of STF at the Angunakolapelessa Prison came under criticism of President Maithripala Sirisena in Parliament yesterday. The President expressed his dismay that the HRCSL Chief had sent a series of questions. “We transferred serious criminals to Angunakolapelessa and deployed the Special Task Force to ensure security. The HRCSL Chief had asked as to why and under whose instructions it was done. It has sent a lengthy question paper. The STF renders a yeoman service. It should be praised. That is why I gave a service extension to its Commandant and it was unanimously approved at the Cabinet. I call on the human rights groups not to hinder me when I try to build this nation and ensure that our future generations would be saved from the drug menace,” the President said. The President also criticised the HRCSL over its calls for thoroughly screening military personnel before sending to the UN Peacekeeping mission as well as for various foreign training, adding that this had led to an unnecessary delay. He went on to say that the two Sri Lankan Army personnel who were recently killed while engaged in the peacekeeping operation in Mali would not have suffered that fate had not the HRCSL delayed the process. “Those two soldiers were due to return to the country six months ago. The vexing of the HRCSL delayed the deployment of new batch,” the President said. President Maithripala Sirisena yesterday in Parliament said that the CID report on the plot to assassinate him and former Defence Secretary Gotabhaya Rajapaksa will be handed over to the Attorney General within two weeks’. “The AG will then accordingly take necessary action based on the report,” President Sirisena furthered. Addressing Parliament during the debate on the Order under the Transfer of Offenders Act, the President set a two month deadline to make the public aware of the names of those involved in the assassinate plot. “After I took the Police under my purview, the investigations are progressing very well. The Criminal Investigation Department had done a praiseworthy job in investigating the plot to assassinate me and Gotabhaya Rajapaksa. They have completed their work. The last statement they wanted was from me. I gave my statement four days before and now their work is complete. They would hand over the report to the Attorney General’s Department and we would all know the names of those responsible within the next two to three weeks,” the President said. President Maithripala Sirisena yesterday in Parliament expressed his dissatisfaction over the Constitutional Council (CC) for not informing him reasons for turning down 12 names suggested by him to be appointed as judges. “The Constitutional Council has rejected 12 names that I sent to be appointed as judges.They are yet to inform me the reasons for turning down those names.”The judges are not happy today thanks to the work of the Constitutional Council,” he said. “The Speaker has sent me a four page letter stating that seniority would not be counted but only merit when making the appointments by the Constitutional Council. It would be a tragedy if the judges are not given promotions on the basis of judgements they had given in the past. If anyone is not qualified then that should be conveyed to me and the Chief Justice. Those who get their names rejected think that I did it. 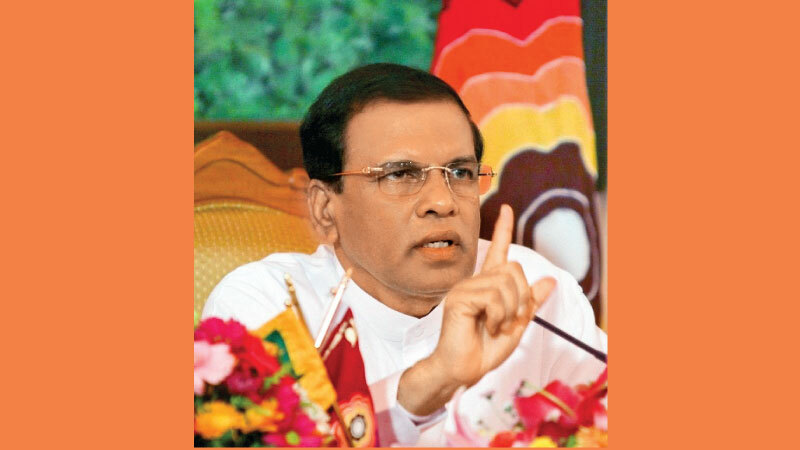 This is a matter that should be cleared,” President Sirisena further said. President Sirisena also questioned about the availability of regulations and guidelines for the Constitutional Council to follow when assessing the skills and abilities of persons if they are not assessed on their seniority.